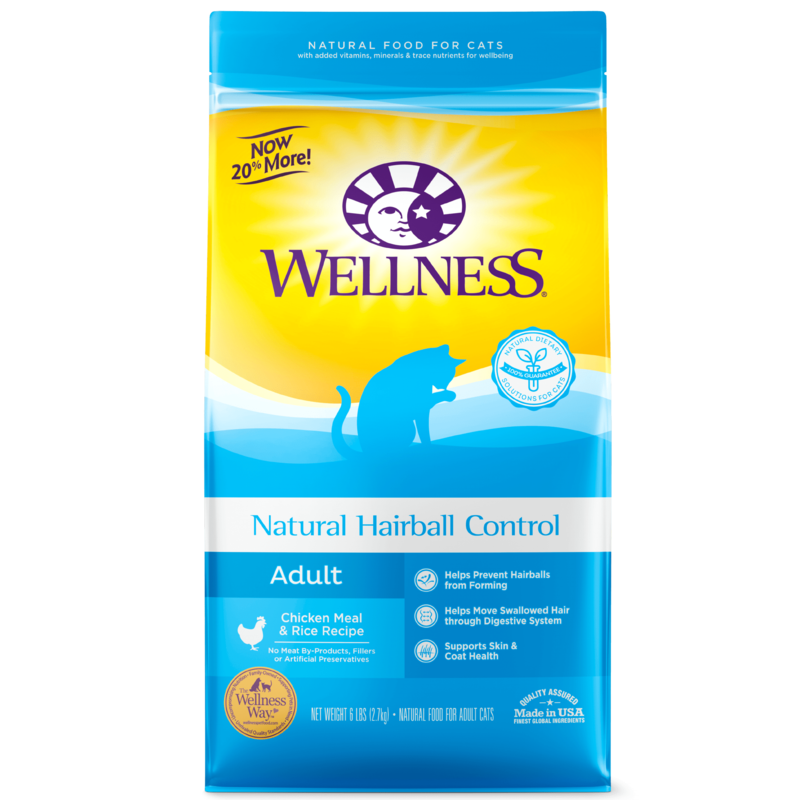 Wellness® Natural Hairball Control formula features a special natural fiber blend that helps move hair and already-formed hairballs through cats’ digestive system. 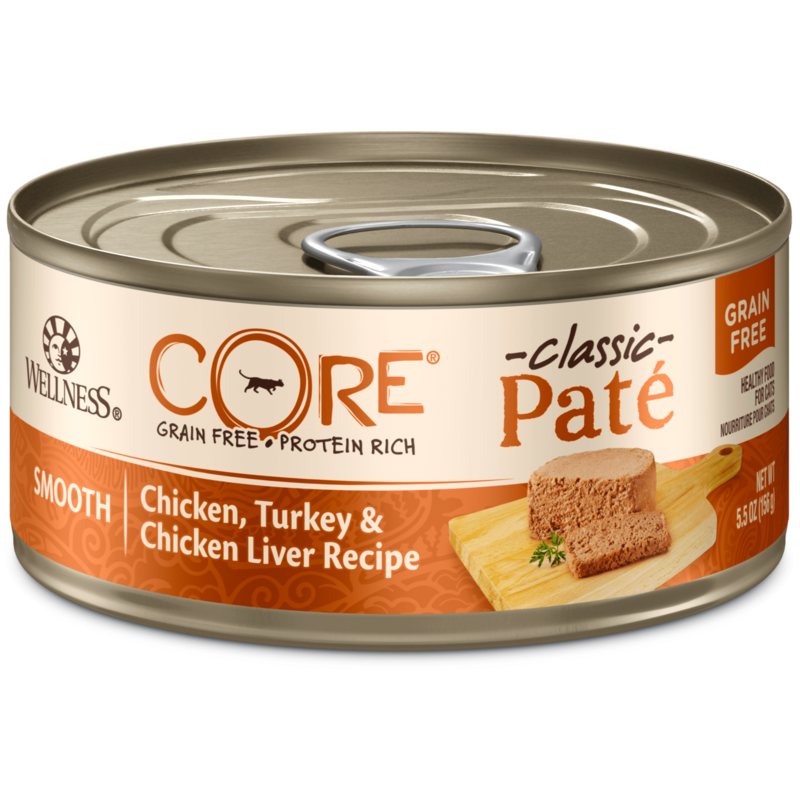 Includes wholesome, savory protein sources cats will love like deboned chicken and turkey. Vitamins and minerals to support skin and coat health, resulting in fewer stray hairs being ingested, and a precise blend of natural fiber to move hairballs through the digestive tract more easily. Thoughtfully balanced with antioxidant-loaded cranberries and L-Carnitine to promote a healthy weight, the recipe supports whole body health and well-being. Available in: 1.13kg, 2.27kg & 5.22kg bags. Chicken Meal, Brewers Rice, Deboned Chicken, Pea Fiber, Turkey Meal, Dried Tomato Pomace, Chicken Fat (preserved with Mixed Tocopherols), Ground Flaxseed, Natural Chicken Flavor, Inulin, Potassium Chloride, Choline Chloride, Taurine, Vitamin E Supplement, Cranberry Powder , Zinc Proteinate, Mixed Tocopherols added to preserve freshness, Zinc Sulfate, Calcium Carbonate, Niacin, Ferrous Sulfate, Iron Proteinate, L-Carnitine, Vitamin A Supplement, Copper Sulfate, Thiamine Mononitrate, Copper Proteinate, Manganese Proteinate, Manganese Sulfate, d-Calcium Pantothenate, Sodium Selenite, Pyridoxine Hydrochloride, Riboflavin, Dried Kelp, Yucca Schidigera Extract, Vitamin D3 Supplement, Biotin, Calcium Iodate, Vitamin B12 Supplement, Folic Acid, Ascorbic Acid (Vitamin C), Dried Lactobacillus plantarum Fermentation Product, Dried Enterococcus faecium Fermentation Product, Dried Lactobacillus casei Fermentation Product, Dried Lactobacillus acidophilus Fermentation Product, Rosemary Extract, Green Tea Extract, Spearmint Extract. 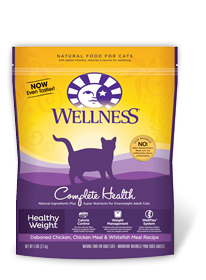 Wellness Natural Hairball Control Deboned Chicken Meal & Rice Recipe Cat Food is formulated to meet the nutritional levels established by AAFCO Cat Food Nutrient Profiles for maintenance. 100% Complete and Balanced Nutrition for Your Adult Cat. This food is formulated for adult, non-reproducing cats over the age of one year old as kittens and pregnant or nursing mothers have special nutritional requirements. Keep a clean bowl of fresh water available at all times. Wellness believes in feeding dry and wet food in combination, whenever possible, to help increase the level of water in your cat’s diet. Nutrition is only one part of the equation! Be sure to give your cat plenty of love, plenty of exercise and see your veterinarian regularly to help ensure total wellbeing. Every cat is a little different, so optimal feeding amounts may vary with age, size, activity level, breed and environment. Divide the total cups per day by the total number of times you feed your cat per day. Please use the information below as an initial recommendation only and adjust as needed. CATS OVER 15 LBS: Add up to ¼ cup for each additional 2 lbs of body weight. CALORIE CONTENT (calculated): This food contains 3,614 kcal/kg or 434 kcal/cup ME (metabolizable energy) on an as fed basis. PLEASE STORE FOOD IN A DRY, COOL PLACE.